“A travel buddy checked in today!” When I say those words, my class cheers, because my second graders (7-8 years) know it means we once again get to spend some time getting to know our world. This valuable program allows my Primary Years Programme (PYP) students a chance to learn and grow with knowledge of international-mindedness. Understanding, respecting and valuing different cultures, embracing diversity and knowing that different perspectives have a great deal to offer. My school has struggled with this aspect of the IB in our short, 5 years of authorization. When a retired teacher friend told me that her idea of travel budies from years ago would be perfect for the IB and the digital age, I immediately realized that this could be a way to promote international-mindedness in our small corner of the IB world. At the beginning of the school year, I ask each student to bring in a travel buddy stuffed animal, one that they would not mind losing if the travel buddy ‘decides’ to live with someone else. I tag each stuffed animal with a note that has my name, school name and address, Twitter, Instagram and email account information to facilitate check-ins. It also explains our idea of passing the travel buddy on to someone else, a relative or not. I make the travel buddy program optional, but all students want to participate to see where their travel buddy goes! Using our travel buddies, my students have broadened their knowledge of the world, geographically, historically and culturally. 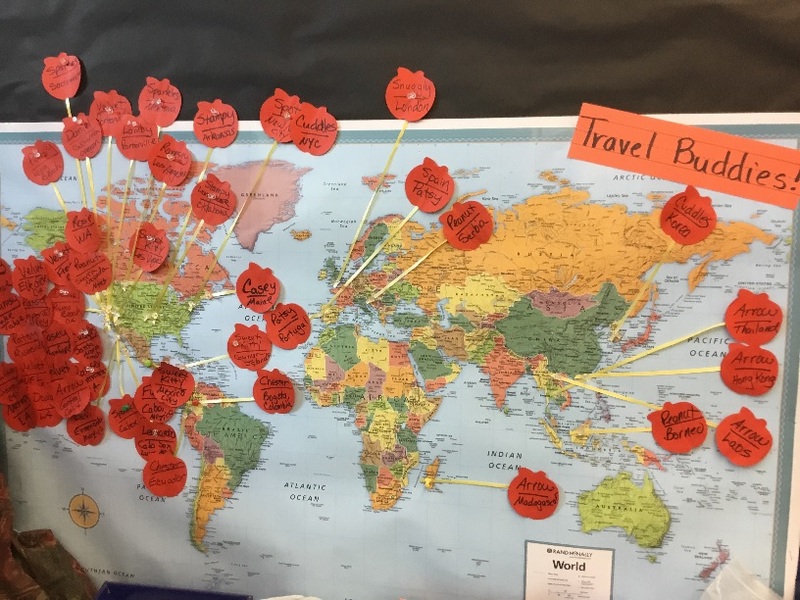 When travel buddies check in from Thailand, Madagascar, Hawaii, New York, Colombia, Ecuador, Spain, Jordan, San Francisco, Serbia and other parts of the world, my students begin to view their world through the fresh eyes of their travel buddies. We use maps and technology to track their travels. We post their photos and travelogues for parents to see. Each photo of a travel buddy creates new conversations about our world: “What is the name of that big waterfall?”, “Those children in Serbia are in school too?”. These connections can, in some small way, blossom into bigger, more global investigations. One travel buddy photo showed two small children who were begging for food, which began amazing conversation and research in our class about global starvation. 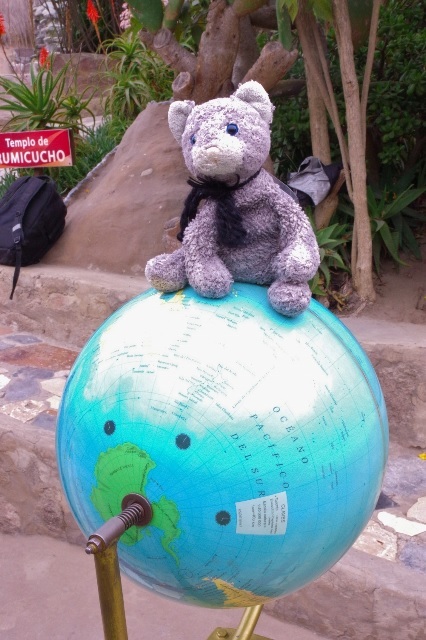 This year, travel buddy Chester visited Colombia and Ecuador, and taught us the culture, history and geography of these beautiful countries. We were able to connect these visits with our unit under the transdisciplinary theme How we express ourselves, a study of artistic cultural expression, when we saw 3D murals outside businesses in Guatape, Colombia that depicted without words what business was inside. 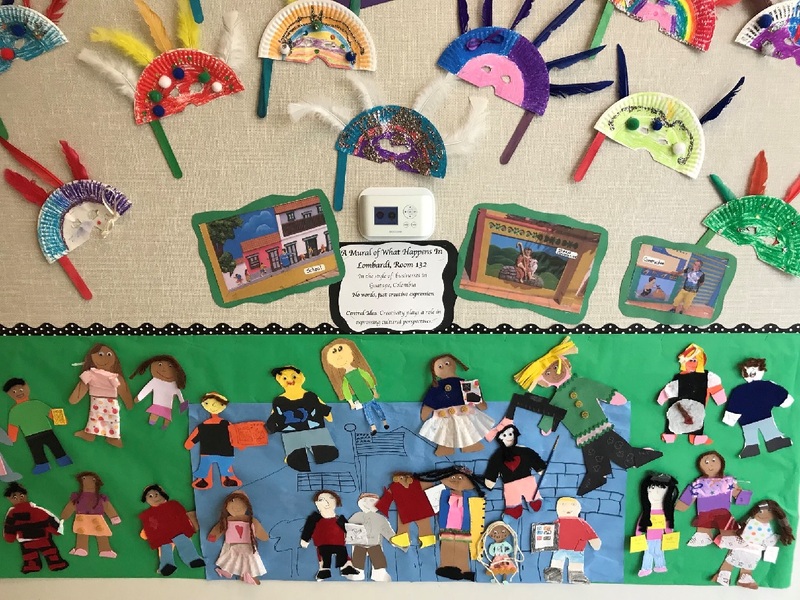 Students immediately wanted to do the same thing, so in a purely student-driven moment; we created our own mural with each student holding something they like to do in class. It is hanging outside our classroom. No words, just creative expression! In my two years of implementing this programme, our travel buddies have traveled to 6 continents and more than 20 countries. Some are passed to relatives for travel, some to strangers who pass them along to others. Almost all of the travel buddies returned to our school last year before the school year ended and we celebrated their travels with a party! Travel buddies take a bit of planning and tending throughout the year, but the rewards in promoting global awareness and international-mindedness are without measure. Our world can use more international understanding. Travel buddies is one positive way my students can grow in knowledge and understanding of the global community. Savage, C. (2017). International-mindedness – teachers are talking about it, but what exactly is it? Barbara Gaffrey is a second grade (7-8 yrs) teacher at Summit Charter Academy, an IB World School in Central California, USA. 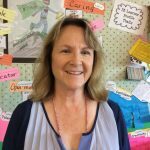 In her 33rd year of teaching 6-7-8 year olds, she has received training in Reading Recovery, English Language Development and has embraced technology in the classroom. She has promoted international-mindedness with travel buddies through social media for two years. You can read her previous articles here. She tweets @GaffreyGrade2. Thanks Laura! I sent you an email. What a fantastic way to get the students learning about the world! This is such an amazing way of delivering the aspect of international mindedness. Liked the idea very much. Thanks for sharing. I love this too! Would love to hear more from you regarding this! Please email me so that I can inquire even more! Hello, and thanks to everyone for your kind responses. My email is bgaffrey@burtonschools.org and I will be happy to answer any questions you have about Travel Budddies. Just send me a note with your questions. Hello Barbara , I loved reading your post. I feel its a wonderful idea to make students know about various cultures around the globe.Thanks a lot for Sharing. I love this idea so much and can see hohw exciting it would be for our students. Can you please email me? I’d love to have more details to share with my teachers. Very informational post.Its a great platform for students to understand about different cultures and values of different countries.